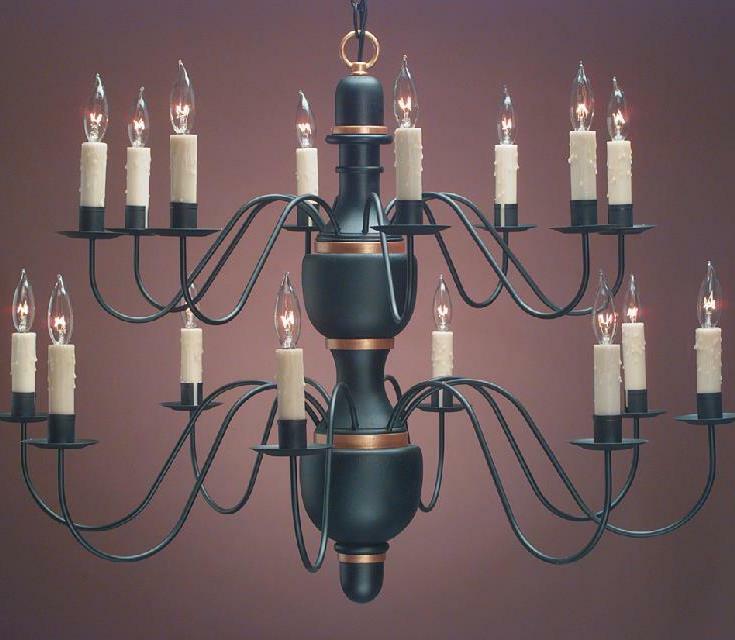 Most importantly, Colonial Wooden Chandeliers from Hammerworks are proudly custom made by hand in America. First and foremost, over 40 years of experience is a testament to our enduring quality. Of course, all of our handcrafted lighting reflects an era gone by, when times were simpler. Most importantly, we use the same wood turning techniques just as the original craftsmen. Also, we form the metal arms by hand in your choice of antique tin or brass finish. 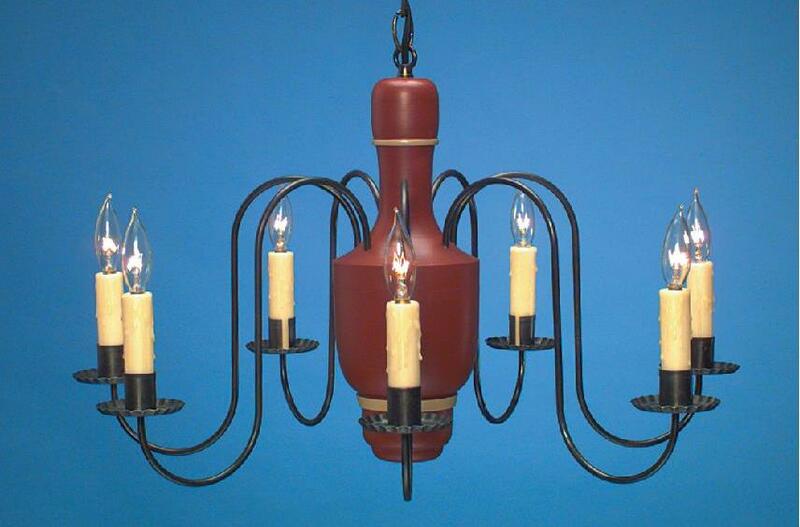 Furthermore, you can completely customize your Colonial Wooden Chandeliers with the color finish of your choice. Most notably, we offer a variety of Olde Village Paint colors as well as stained hardwood finish options. Certainly, if you choose to supply your own paint or stain color we are happy to comply. Especially relevant, each of our Colonial Home Wood Chandeliers is supplied on a standard basis with a matching ceiling plate and 2 feet of chain. Of course, if you have high ceilings and need more, you can order additional chain for a small charge. 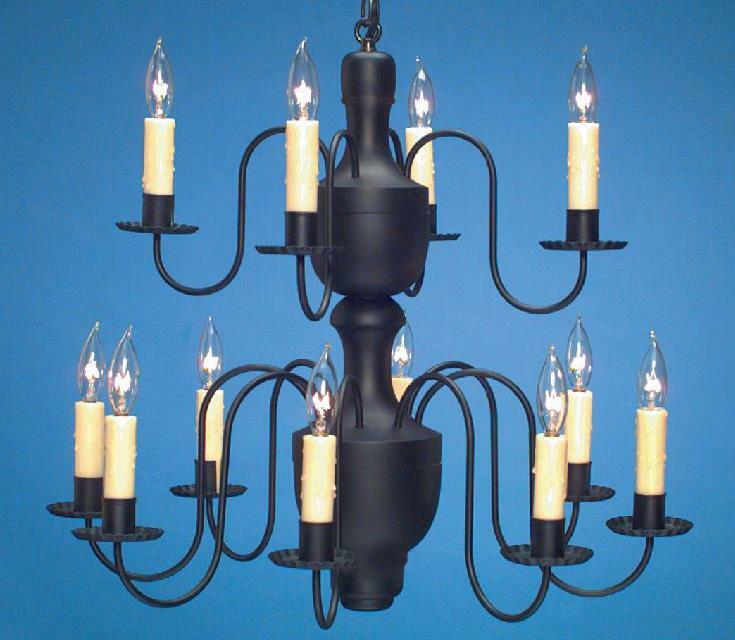 In addition, each chandelier arm can accommodate up to a 60 watt candelabra base bulb. Certainly, because we create these Rustic Country Wood Chandeliers in various sizes, your options abound. 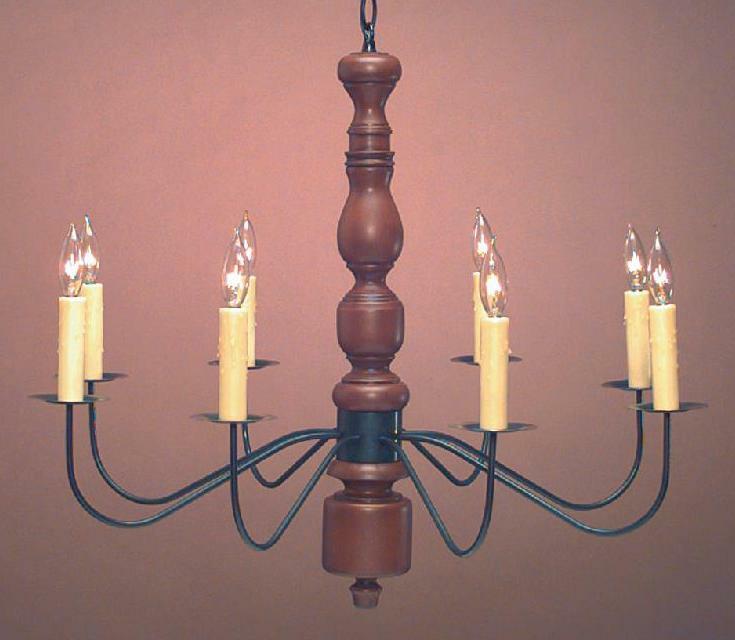 Therefore, our Colonial Wooden Chandeliers range in size from 1-3 tiers in height, and narrow to wide widths. Consequently, the flexibility in color and size assures that our custom made Early American chandeliers are suitable for any size room in your home. Most of all, from a petite Country Wooden Chandelier in small kitchen nook, to grand Elegant Colonial Chandeliers in a stately great room, we have a model to meet your needs. 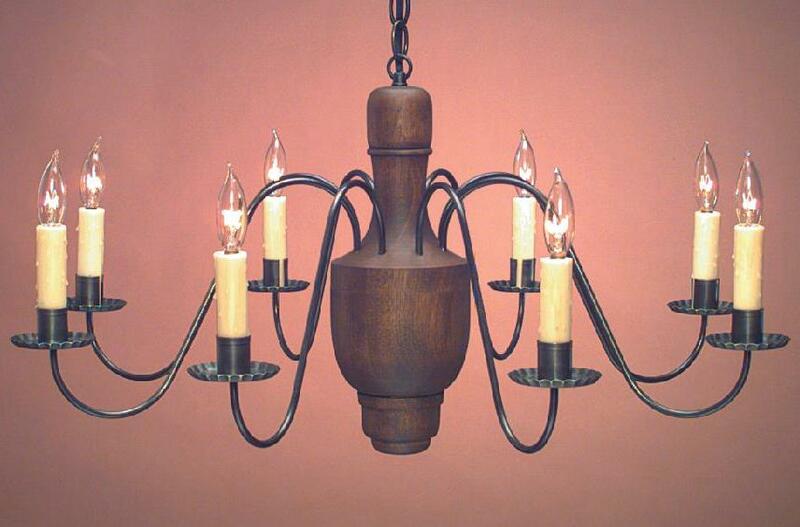 For example,consider the simple yet elegant Early American Reproduction Wood Chandelier CH109. Of course, no matter which model you choose, you can be assured that our Colonial Country Wooden Chandeliers will complement any of our handcrafted rustic style wall sconces. No matter what, when you choose Hammerworks you are assured of enjoying custom made heirloom quality Colonial Wooden Chandeliers for years to come. 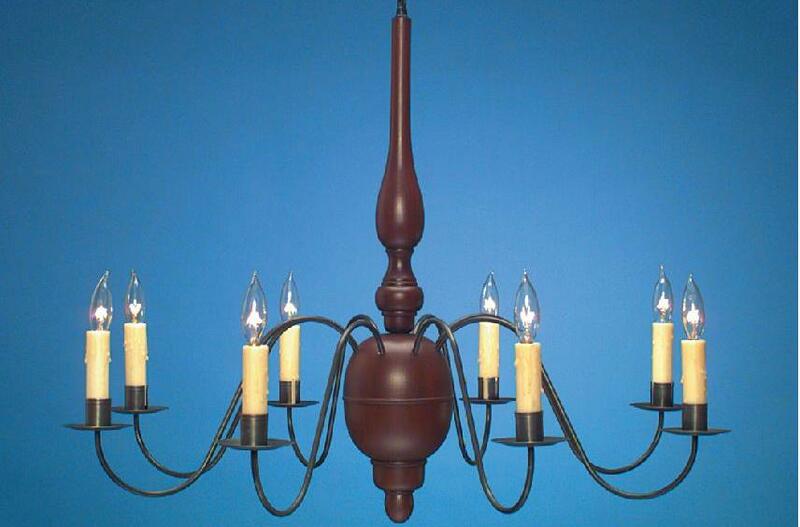 Shopping for a new Traditional Colonial Wooden Chandelier for your dining room? Certainly you will love the abundance of choices we have to offer! Maybe you should consider our Country Wooden Chandeliers, such as the CH203, with its’ graceful tapered center and cascading arms. Or, perhaps you have a large formal dining room with high ceilings? 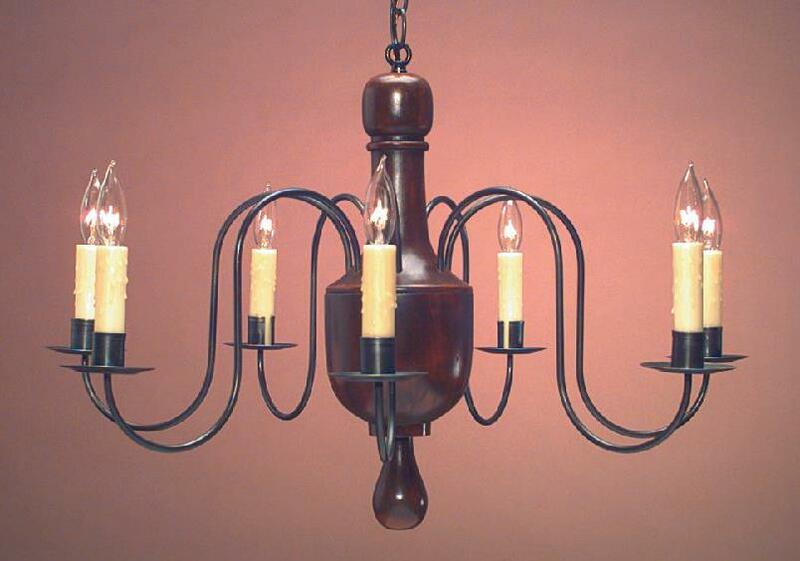 If so, then the double tier Elegant Colonial Chandelier CH322 is just the thing! 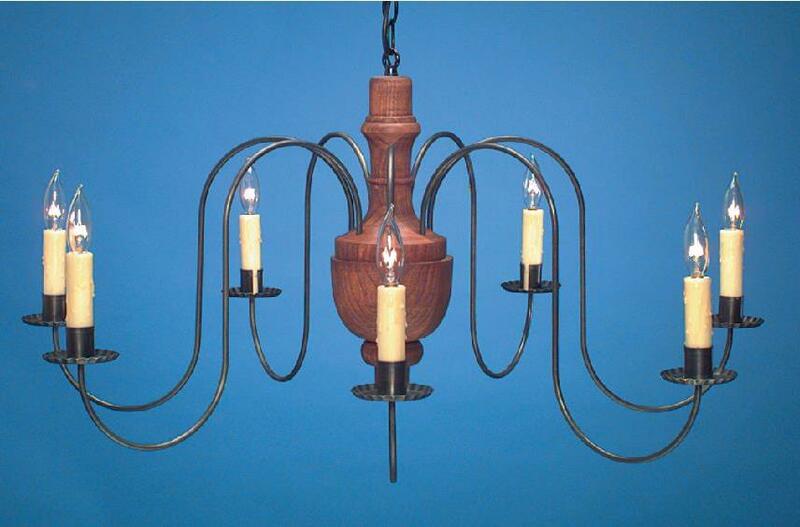 Historically, wooden or Colonial Tin Chandeliers provided the lighting needed in Early American home gathering areas. Just as in those early New England times, our craftsmen are able to marry the beauty of turned wood with the gracefully formed metal arms. Hence, the result is custom lighting that truly is American. Thus, whether you are decorating an antique Colonial Home, Cape Cod Cottage, or New England Farmhouse, any of our traditional dining room Colonial wooden chandeliers are ideal choices. In contrast to the Colonial Wooden Chandeliers, we also offer a selection of Early American Reproduction Brass Chandeliers. As always, we handcraft each rustic style brass chandelier. Most notably, we design them after those found among early lighting artifacts. Above all, while appearing simple and utilitarian, the timeless style of our antique reproduction brass chandelier fits a wide range of settings. Certainly, models such as the Colonial Brass Dining Room Chandelier CH100 are an ideal choice for your Colonial Williamsburg Home. Or perhaps the classic simplicity of our Antique Brass Chandelier CH116 is perfect for the dining room in your Cape Cod Cottage. 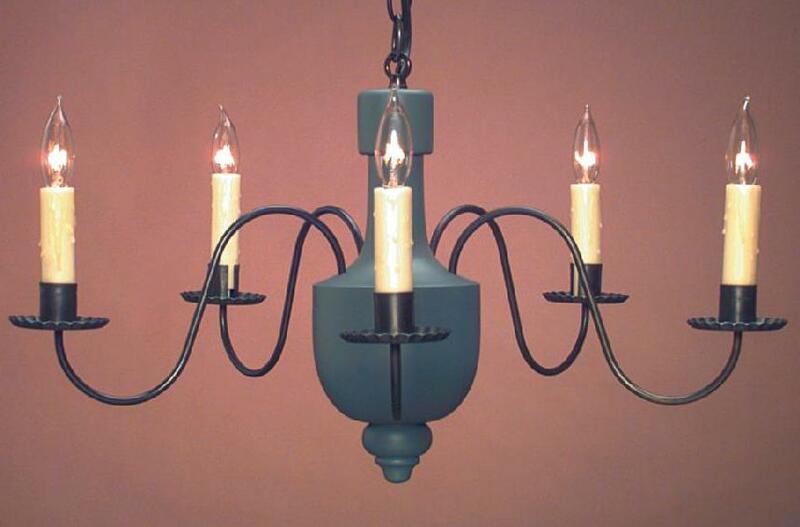 Furthermore, adding Colonial Wall Sconces are a perfect way to coordinate your room’s decor. Thus, from the simplest Country Farmhouse to an elegant Federal Style Colonial Home, we offer the best Early American Reproduction Brass Chandeliers for your needs. Especially relevant, in addition to brass, we offer a nice selection of Colonial Primitive Tin Chandeliers. First of all, smaller period reproduction chandeliers, such as CH103A are ideal for use in hallways, bedrooms or intimate dining areas. Likewise, models such as the CH103 Colonial Reproduction Tin Chandeliers offer an excellent reproduction lighting choice for a farmhouse country kitchen. 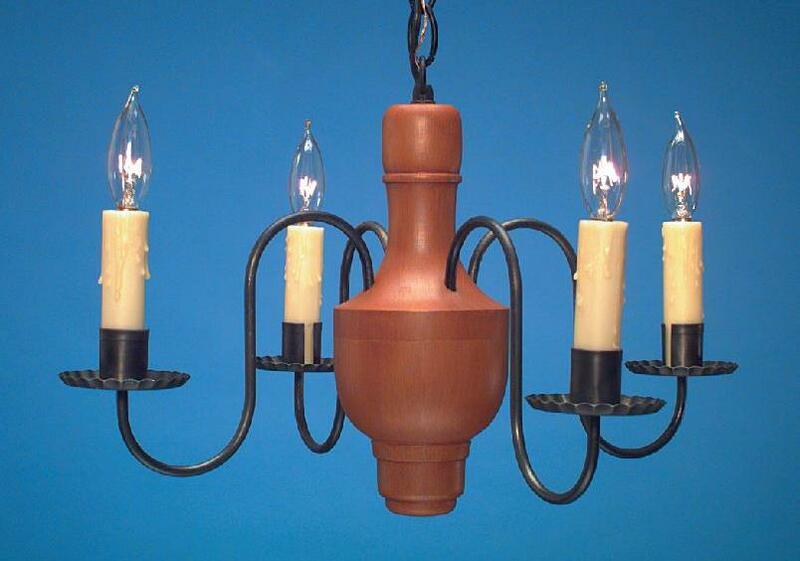 Or if you have an area with limited height clearance, consider adding one of our versatile Colonial Ceiling Lights. 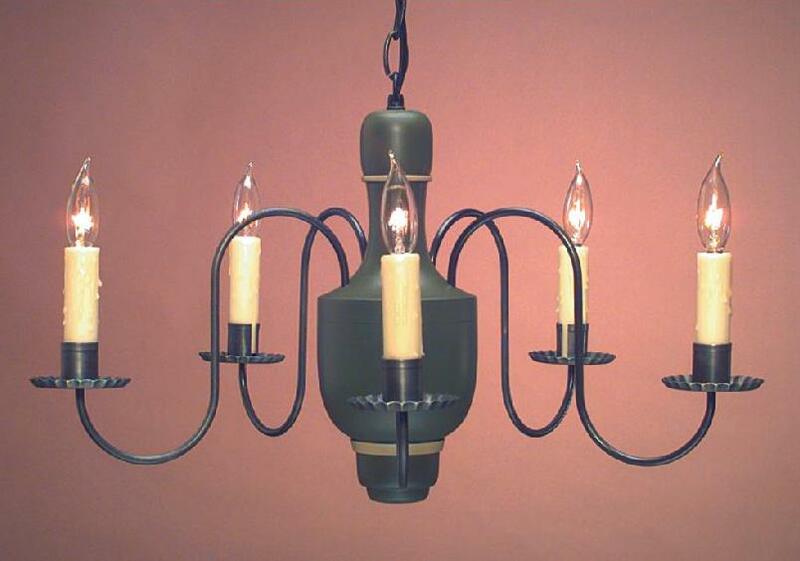 Similarly, a comparable style is the CH201 Chandelier. These impressive two tier Reproduction Colonial Tin Chandeliers are an excellent choice for a period style dining or great room. Of course, just as our Colonial Post Lanterns correspond with Colonial Wall Lanterns, a country home primitive tin chandelier easily pairs with any of our reproduction antique tin wall sconces. Hence, this versatility allows you to coordinate with your decor. As a result, from kitchens & family rooms to bedrooms & hallways Colonial Primitive Tin Chandeliers are a perfect decorating accessory.